You are here: Home / Crochet Other / Giveaway / Wow! Check out this Giveaway for a BlocksAll Premiere 812! If you have ever wanted a blocking board to straighten out your afghan squares then this is one giveaway you will want to enter! 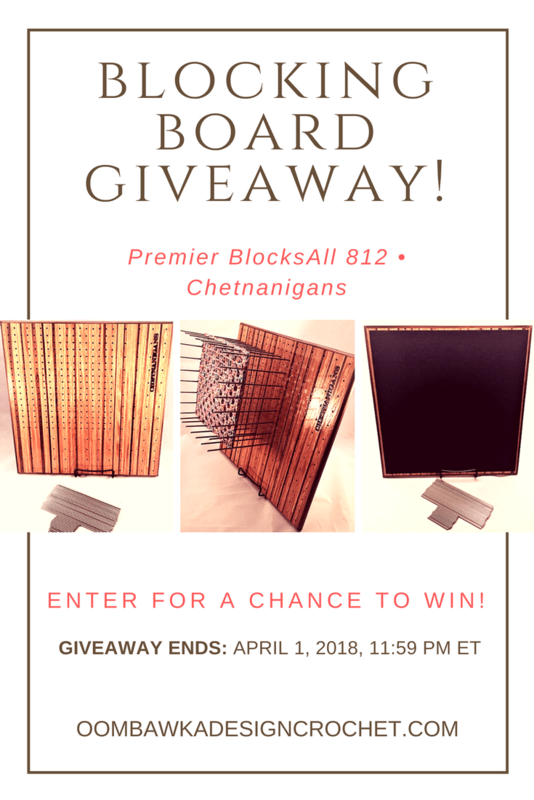 Chetnanigans™ is having a super giveaway for a BlocksAll Premiere 812! This giveaway is being done a little bit differently from our regular giveaways so be sure to read on to find out how it works! There are multiple blogs participating and the final winner will be announced LIVE on the Chetnanigans™ Facebook Page on April 4th! If you are unfamiliar with the BlocksAll Premiere 812, this beautiful handmade blocking board includes a total working surface area of 12 inches by 12 inches. A full 8 inch by 8 inch square area is set-up with 1/2 inch spacing, while the remainder of the board is set-up with 1-inch spacing. The beautiful stripped appearance of the wood is created by gluing 120 strips of wood together to create the finished blocking board. The felted backing protects your working surface and four coats of Polyurethane provides a beautiful finish, as well as, protection against blocking damp items! The NEW BlocksAll Premiere 812 retails for $159.00. Enter for a chance to win a Chetnanigans™ BlocksAll Premiere 812! This giveaway is open to residents of the Continental USA and Canada; where allowed by law. Void in Quebec. On April 2, Rafflecopter will randomly select one winner from all the entries submitted at Oombawka Design Crochet. I will then forward this winner’s name and their email address to Sean and Holly at Chetnanigans™. On April 4, Holly and Sean will draw one name from all the winning names from all the participating blogs and announce the BlocksAll Premiere 812 Winner LIVE on their Facebook page. This is the link to the Chetnanigans™ Facebook Page. 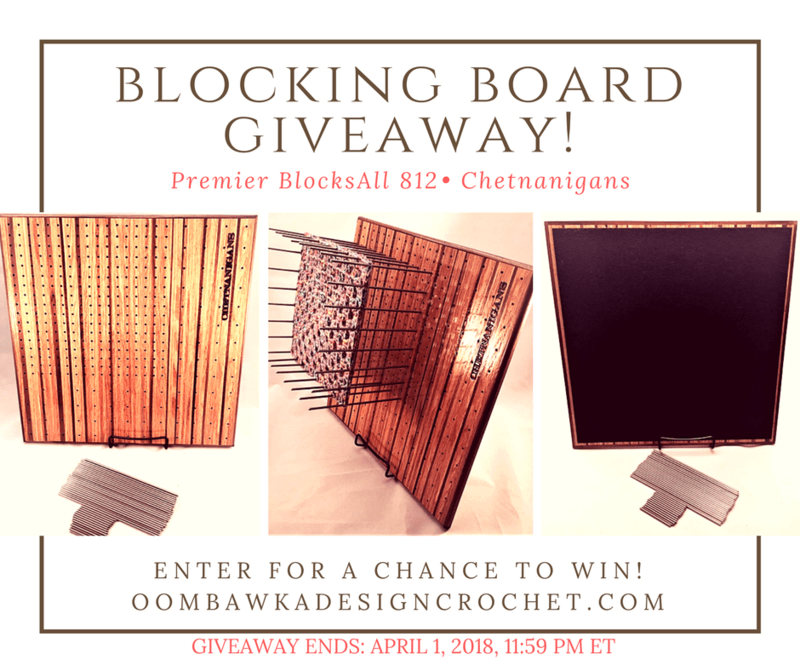 Enter the Blocking Board Giveaway Here! If you cannot see the Rafflecopter Widget below, please click >>HERE<< to enter. I would like to thank Chetnanigans™ for allowing the readers of Oombawka Design Crochet to participate in this Giveaway! For more information about Chetnanigans™ please visit their Website, Etsy Shop, Facebook or Instagram. I love your post about Chentanigans Boards. I have been looking for something to block squares and snowflakes and think this would be perfect!! Books are a treasure and I am very interested in More Crochet socks. The possibilities are endless. I do really like your site. But I do not like that raffle coptor widget. So I will not enter this give away . What happened to just plain entering. If I did not have a family and stuff that has to be done. Then maybe. Thank you for reviewing the Chetnanigan Boards. This is on my wish list. I think they will work wonders on my snowflakes that I love to crochet. These blocking boards look amazing. Thanks for the giveaway Oombawka and Chetnanigans! Wonderful! I love their stuff. This is a wonderful way to block anything. I am entering the contest because I would like to win one, but may have to invest in one if I don’t. Thank you for the chance to win this!